A week before school started and I had to sit through a horrible professional development that was put together by our “network literacy specialist” who, when I asked her where she got the document she responded that ” it was something I got from a friend.” As if that’s good enough. Thank you for your honesty in describing how you waste my time with such little forethought. 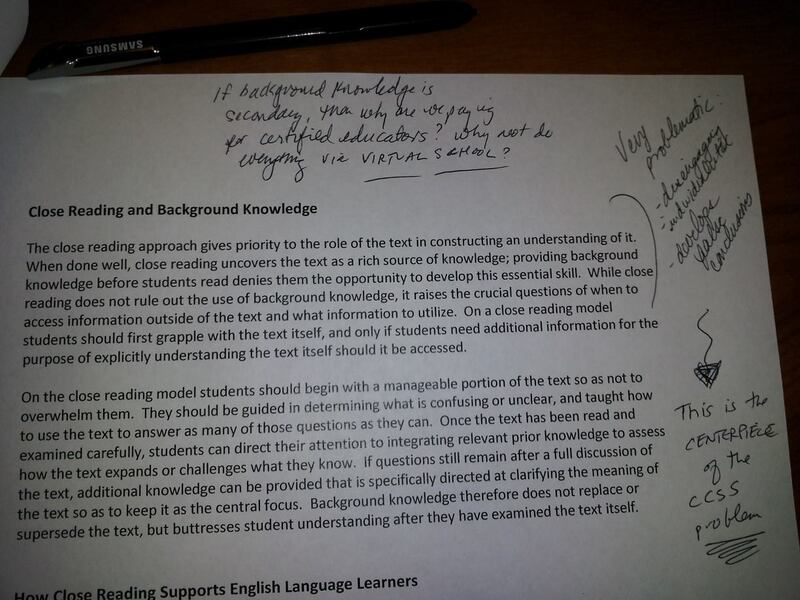 The text below (Dees) was given to teachers as professional development on literacy strategies for CCSS. The disposition we take is that this should be text-dependent reading, un-contextualized (second pic). 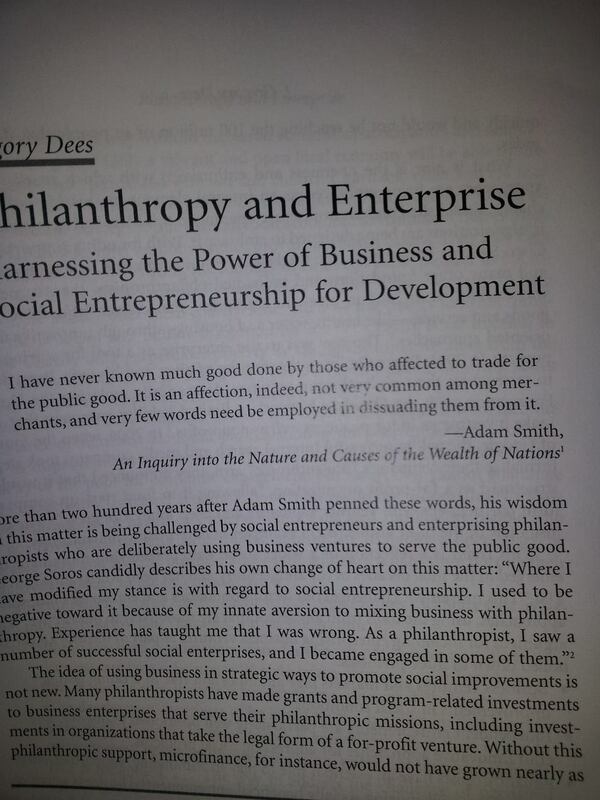 This document expounding the virtues of vulture capitalism and philanthropic colonialism is meant to be read w/o understanding all the grief those two practices have caused in the world and more intimately in our Chicago communities. This is why educators must fight the common core animal head on. No text is without CONtext. Today the Examiner published a poorly-researched op-ed extolling the virtues of Common Core, missed the boat completely and declared that professors -the one he interviewed- think that the CCSS will improve “teachers expectations of learning for young black and brown men in Chicago and nationally,” even while admitting they probably won’t be implemented well in Chicago. Which is true. I call into question a serious assumption that he makes: It is extremely problematic to call reading the “most basic of skills…” To be sure, there is NOTHING basic about reading. As literate adults, we take for granted and forget that, but the reading process is extremely complex to both learn, and to teach, and only more so under threat of high stakes (testing, school closures, merit pay), and the conditions of our schools (rising class sizes, no AC, students experiencing trauma). The CCSS are written in a way to declare that if any given young person is meeting standards, they should be able to “analyze context given a piece of text” via critical thinking. But without context a reader cannot place importance or relevance into a given document, and therefore critical thinking DOES NOT take place at all, and the standards ultimately feign neutrality in the face of “bipartisanship.” Real neutrality means analyzing text and contexts. As I say to my students, “we must read the word AND read the world.” CCSS does not ask this of young people. It does not matter what kind of standards are developed or aligned to what kind of tests. The only way to make learning valuable for young people is to make sure they have context for learning. No set of standards can provide context. Only when we recognize to invest in the people who engage in both teaching and learning will we start to value the process as a whole. 1) Invest in humane and developmentally appropriate facilities and conditions for teaching and learning. 2) The job of Principal should not be “building manager,” but “teacher-leader” as they were 50 yr ago focusing on staff development. 3) Individualized Professional Development Plans: Support for educators to work on what they want to work on that directly translates to improved curriculum and instruction for students. 4) A rich and varied curriculum of not only STEM, but the arts, humanities, health, civics, and vocational experiences. All of this is not cheap. But I am convinced that if the United States can afford 4 wars in 10 years, or money to bail out major banks we can afford a dignified education system for all children. The need for standards is a myth, but a lucrative one at that, and pervasive in the education reform world. As educators we roll our eyes, but we need to speak up and expose what it actually does to curriculum and instruction – and ultimately students- is harm. Common-Core Standards: Gates and Pearson team up to Develop Online Curricula…in a box! This week The Bill and Melinda Gates Foundation and Pearson Education Publishing Goliath announced they will partner up to develop a curriculum to be implemented along with the Common Core State Standards. It makes me nervous for my teaching craft. To say that anything is common or standard about the learning process doesn’t respect the kinds of creative thinking that the human brain can do, and certainly doesn’t respect the kinds of diverse experiences of my students. The CCS assume that 1) there is a clear understanding of “what learning looks like” 2) global competition is the ultimate contribution to American society. Any teacher (or non-teacher) who has read James Loewen’s Lies My Teacher Told Me recognizes the kinds of hero-ification that (the few) Big Publishers (Pearson, Houghton-Mifflin/Harcourt, Heinemann, McGraw-Hill, etc.) produce for our society in a little over 300 pages. Whose stores are told; values represented in these compendia? More over, whose voice are excluded? I am definitely curious to see what Gates and Pearson come up with for their Common Core Curriculum, but I not convinced it’ll be the cure for what ails curricula.